[M]ost early profiles of Pope Francis describe him as a theological and political conservative, largely based on two points of his biography: that he resisted some expressions of liberation theology as a Jesuit provincial in the 1970s, and that he’s had a rocky relationship with the center-left government of Argentine President Cristina Kirchner, especially over the issue of gay marriage. While both things are true, people who know the lay of the land here insist there’s little meaningful sense in which Bergoglio could be described as a “conservative”, at least as measured by the standards of the church. If Cardinal Bergoglio is considered a "conservative" in Argentina, one can only guess what an Argentinian "progressive" is like. One thing seems to be agreed by all sources, including Argentinian newspapers, Italian reports, those interviewed by other media in the past few weeks: Jorge Mario Bergoglio is a man of steely convictions and determination, possibly the strongest Bishop of Rome since at least Pius XI, possibly the pope with the most hands-on approach since Saint Pius X, and who will not change one bit the man he has always been. Which is why his past and the way he acted in the past greatly matter. He is also, as we have said before, a highly liturgical pope, and he will make all efforts to make his liturgical vision stick. When he was younger, wasn’t he also fond of a parakeet? Yes, when he was in the novitiate, they had a parakeet and Jorge loved it. He taught it to say some things … knowing him, it probably wasn’t a prayer but some sort of insult! Well, then we have what we have and knew we had it all along. Changes in the papacy which bring radical changes in direction from one Pope to another (especially in the worship of God) -- just like a change from a Republican to a Democratic Presidential Administration: this is not the Catholic Church of history. Something has gone very wrong: diabolically wrong. NC, can you independently confirm this? If so, additional prayers are needed by all. There is such a tremendous gulf between the progressive Catholics of the 20th century--who literally tried to destroy the Church from within--and the protestantized "Vatican II" Catholics who predominate in the Catholic hierarchy and in many well-meaning circles. I wish we would not carelessly conflate the two. Intentions matter. The progressive movement was diabolical,having its roots in pride. It is dying out in large degree, thanks to many factors, including the efforts of many neo-cons and VII Catholics. The VII movement is an attempt, perhaps naive, to follow the lead of the Church in the 20th Century. To follow a Council and six Popes with reputations for personal virtue. While there is no doubt in my mind that the Second Vatican Council has born very bad fruits for many reasons, those who follow it believe that they are submitting themselves to the service of the Church. Such obedience should not be so casually demonized. God works with our sins, weaknesses, foibles, and ignorance. Catholics trying to follow the lead of devout Popes like JPII and Francis, two great men by many, many standards, will not be abandoned by Our Lord. Francis appears, by all accounts, to be deeply devoted to the Eucharist, to Mary, and to evangelization. I expect his style to be frustrating sometimes, based on my understanding of things, but I am not expecting a catastrophe. The Lord is merciful. Your remarks are well taken. However, don't forget that many of the "Vatican II Catholics" have gone out of their way to demonize traditional Catholics. That doesn't seem very devout to me. Cosmos, with all due respect: the catalyst for the Church's version of the French Revolution was Vatican II. It was the culmination of a long battle between the Thomists and the post-"Enlightenment" philosophers within the Church (essentially a war against ontology by the forces of existentialism)as well as between the Roman School of theology and the proponents of the "Nouvelle Theologie." The advocates of the Modernist heresy had for more than 100 years before the Second Council of the Vatican formed cadres which directed a revolution within biblical, liturgical, philosophical and theological studies. Read the fascinating account in Professor de Mattei's "The Second Vatican Council." Any fair reading of the Bergoglio legacy in Buenos Aires should offer fair warning as to the consequences for the future of the papal magisterium to which we will be the witness. Cosmos said, "I am not expecting a catastrophe." Just don't leave yourself to be a sitting duck. 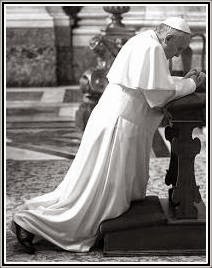 If Pope Francis is as staunch a defender of Christ's Church as St Pius X, we have a lot to be thankful for. I had dinner last night with a group of Catholics, and a man who happens to be a native of Argentina was present. His reports confirmed everything Rorate has said (and he knows nothing of this blog, nor did I ever mention it). Bergoglio has never pleased conservate Catholics in Argentina, he said, because he never made waves about the moral crisis in that country. His focus was always and only on the poor. His quote: "Bergoglio the conservative is a media generated myth." "He taught it to say some things … knowing him, it probably wasn’t a prayer but some sort of insult!" Obviously by posting this article you are anti-catholic, anti-woman, and anti-science. Furthermore, based upon the comments you have allowed to be posted on this thread, you are also obviously an anti-semitic rad trad. Everyone knows that true Catholics would never-ever-ever say or write anything that might, in the remotest chance, be interpretated as displeasure with or concern over anything the Pope says, writes, does, or wears. Rather, if you are a true Catholic, you must highly praise how innovative, humble, wonderful, lovely, and beautiful everthing he does, is. Moreover, it is crucially important to highlight everthing he does differently than his predecessors, especially living-retired ones, and point out how blessed we are to finally have a Pope of the New Evangelization. Similarly, you are not allowed to ever associate with, talk to, nor think of, any people or groups that do not have a full mastery and acceptance of evolution, modern history, and the literary masterpieces of JK Rowling as taught by secular universities. Finally, you must admit and proclaim that the emperor's new cloths are very pretty. P.S. Don't even think about mentioning Vatican II, unless you are saying or writing, "I love Vatican II." Oops, sorry, True Catholic! We love Vatican II. JAK: "Don't forget that many of the 'Vatican II Catholics' have gone out of their way to demonize traditional Catholics." True, as we have been personally reminded in the past few days. Much worse, of course, are those who have misgivings about post-conciliar events, but demonize traditional Catholics with even more vigorous hatred, either to sell books, or to ingratiate themselves with publishers, or with those who would despise them otherwise. It is impressive how they write and speak insane and violent words to earn "respect" from the wrong side, "that they may be honoured by men: Amen I say to you, they have received their reward." Of course, the answer from us is the same we advise others to do: do not engage, never engage, we should not engage with those in need of a certain kind of help. Maybe the poor parakeet is still alive, and repeating simple, humble words like "mercy, mercy, mercy!" Candidly speaking, here and elsewhere, few people observing the post-conciliar church and its papacies appear to know what "conservative" means. 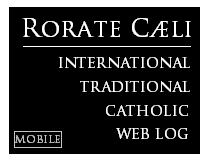 Moreover, even fewer evidently understand what Traditional Roman Catholic signifies. If H.H. Francis realy is strong minded and determined, it's better then to be a jelly fish. It means he can trigered off in either way in the right moment for better or for worse. Prayer, whichis slow, focused, confident and cloud pearcing, landing right before the Throne of The Almighty is needed for him now perhaps more then anytime before. they usually live 20-30 years with a maximum of ~35 years. If he had one in his novitiate I doubt it's still alive. There are at least 50 species of Parakeets/Conures within Genus Aratinga and Genus Pyrrhura. I wonder which species Pope Francis had? The term "parakeet" is very general and the picture of the Blue-crowned one posted here also on avianewb.com and Wikipedia so I doubt it relates to the bird he actually had. 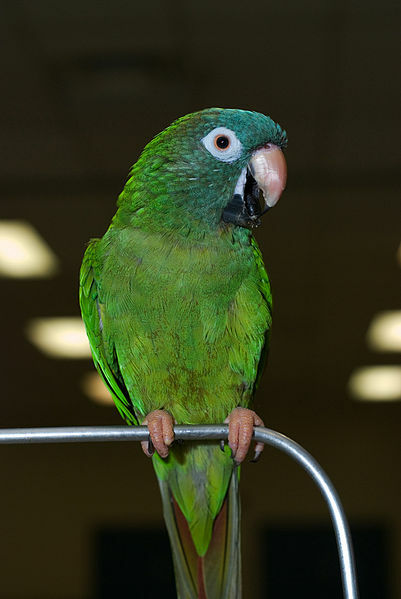 In case you're wondering why I recognize the bird in the picture, I have two relatively well behaved conures that are approx 18 years old. Thanks for the information, Anonymous (Ornithologist). "Parrots don't seem to appreciate the TLM"
If you take time to teach bad words to a parrot it says something. What does such a one teach to higher life forms? The advocates of the Modernist heresy had for more than 100 years before the Second Council of the Vatican formed cadres which directed a revolution within biblical, liturgical, philosophical and theological studies. For the mystery of iniquity already worketh: only that he who now holdeth do hold, until he be taken out of the way...Therefore God shall send them the operation of error, to believe lying: That all may be judged who have not believed the truth but have consented to iniquity...Therefore, brethren, stand fast: and hold the traditions, which you have learned, whether by word or by our epistle. "..and he will make all efforts to make his liturgical vision stick"
Yeeeaaaaaahhhhh. That's kind-of the problem from where I sit. So far, his liturgical visions seems to be fairly close to the "let's make it 'relevant' to a particular group of folks." Trouble is, that usually means that any traditional understanding gets the heave and we're stuck with what some "liturgical expert" thinks makes sense. I almost always wind up scratching my head in bewilderment with "relevant" acts. Cyril said, "Something has gone very wrong: diabolically wrong." And if one wants to pinpoint the moment it went wrong, let's look to the vision seen by Pope Leo XIII of all the demons in hell falling onto the Vatican. I wonder of this parrot was the famous "Norwegian Blue" variety? It often "pines for the fjords" and prefers "kipping on its back".